I like thank those who attended last year and in 2009. For without your support this year probably wouldn't happen. Teams such as ProjectRide.net, High Octane Tuners, and MOCC will be there to support our fund raising efforts by bringing out some sweet rides! If you have a team, just let me know how many of you are rolling together. We are expecting vendors such as AutoSport209, Detail Addict, 12v Spotlight, and others not yet announced. Support from our dealership vendors such as Diablo Dents, Finishing Edge, B&S Hacienda Auto Body, Advance Interior Restoration, and even factory support from Lexus will be on hand to make sure there will be some great raffle prizes. Food Trucks will on hand plus Dryers ice cream to top it off. We may have a funnel cake vendor again too! We will be using both the left and right side of UMIGO's building, plus the roll up doors to the track will be wide open to allow the action to flow from both sides! We should have either two DJs or one DJ and a live band! We will have trophies as well! Categories will be expanded this year. As of right now, we have space for about 200 cars. Remember, we aren't looking just for fully built cars, but mildly modded ones are welcome too. Parking will be close and easy. Motorcycles are welcome to come and show too! Let me know what you guys think, but go ahead and shoot me a PM of who is pretty firm on showing this year. I will be updating details as I get them. Well, we are at the final 3 weeks before the event, I like to thank everyone who decided to support us. A special thank you to those which is has also become an Annual event as well. 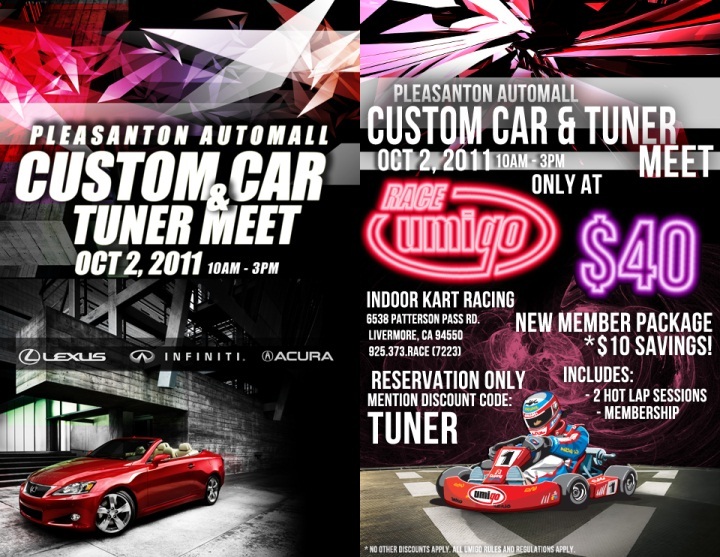 This is our 3rd Annual Custom Car Meet and I look forward to trying to meet everyone that day. This is a children's charity event for Coins for Campers. Providing disadvantaged or children with disabilities, opportunities to attend camps and outdoor events. Here are details of the day. Special Racing rates for the day! 2 Hot Laps sessions (about 30-38 laps) with a one year membership included. Only $40! Save over $20. Raffle prizes will be noted on the day of the event. Tickets are only $1.00 each and all proceeds go directly to the charity. Last minute prizes may be added on the day of the event, so keep a watch for the latest news. Music by: DJ Place and a Live Band to be announced. See John Nguyen for all your performance needs. Specializes in suspension modifications and engine tuning. Hot! They just installed an in-ground alignment rack. One of the only ones in Northern CA. So if your car has 2" ground clearance and needing your suspension worked on or adjusted, Autosport209 is your answer. Leo Chan can keep your car looking its best. Leo and his family operates a premium level detailing operation. From basic wash and wax to full concourse level detailing, Leo has you covered. If you are a do-it-selfer, no worries. Detail Addict has everything to pamper your car, motorcycle, boat, or plane. Wholesale and group buy inquiries welcome. Red Bull Energy - Everywhere. In your face professional level racing on one of the most scenic and beautiful race tracks in the country. Home to the World Famous "Corkscrew" turns. See Tony Sanchez when you need collision and restoration repairs at reasonable prices.This Family owned and been in business since 1956. With 4 locations serving Pleasanton, Livermore, Dublin, and San Ramon, Tony and family has got you covered. Nothing is more frustrating than getting a door or fender ding. You spend all your time keeping your car looking its best but someone who doesn't respect your hard work swings their door wide open or let's a shopping cart run into your car. Chris Jacob can take care of that for you. Many times avoiding the need to repaint and at a fraction of what it costs at a body shop. Got a bumper scratch, door or fender scratch or small dents where the paint has cracked? Mike Jacob (yes he is Chris Jacob's brother) can take care of those at a fraction of what a body shop may charge. Need wheels painted, powered coated or curb rash repaired? With expert color matching Mike can make it look as good as before or better. Is your leather or dash is cracking or fading? Small tears in the seats or door panels? Leather sealing and factory approved dying process are just some of their services. So whether its a minor cosmetic repair to full custom reupholstery that Tom offers to his years of satisfied customers. His mobile repair unit is a fully stock repair center. Give Tom a call for all your interior repairs. Needing some minor body and paint work? Don't have time to bring your car to the shop? No need, Whether it is at your home or business call Monica or Luis Lopez to schedule a repair at your convenience. They perform expert paint color matching, painted wheel repairs, dent removal at a reasonable price. ASE and PPG certified. Racing in the street is not only illegal, but can be dangerous. Introducing Fast Pace Racing, Peter Domj runs a modular indoor RC race track in the South Bay. With drifting and circuit type racing on hand the action never stops. Learn to drift or get the best track time without the tickets or big $$$ for racing. Give Peter a call or stop by to check it out! Whether you are an aspiring model or actress looking for a booking agent or need additional promotional exposure then Gary Soares is who you need to contact. If you are hosting an event and need some talent to make it a memorable one for your guest, then you need to contact GM Girlz. HOT! GM Girlz will has an open challenge to any other models in a First Ever Northern CA Go Kart Race Off! Choose who will win and get extra raffle tickets! Details coming soon! Food trucks will be on hand and Red Bull will be serving ice cold refreshments! There's still room for a few more cars or teams! Contact me as soon as possible for your spot! This looks to be a great day for all who attend..